You call that a taper tantrum? 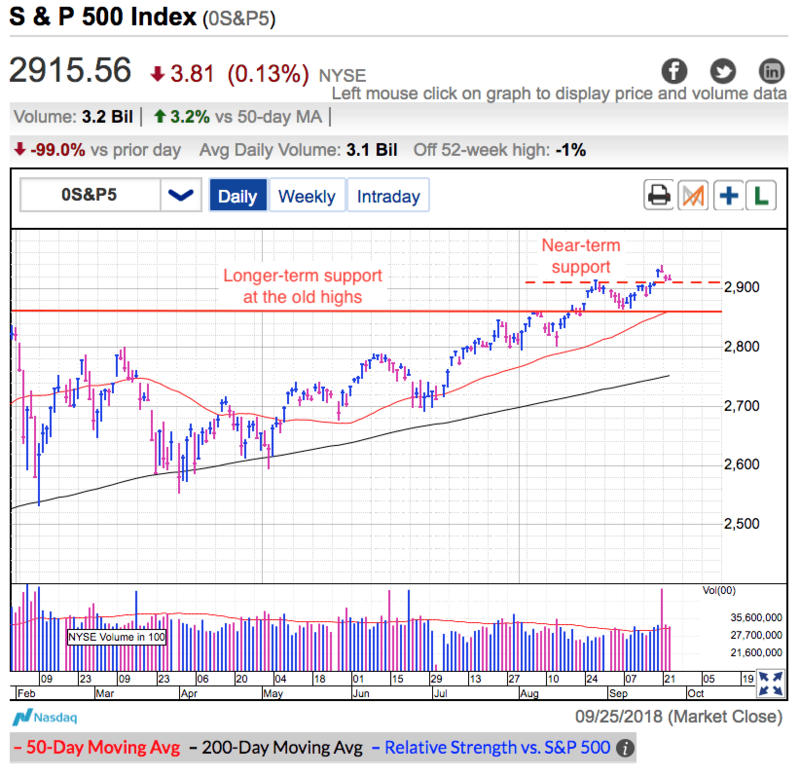 On Thursday the S&P 500 recovered Wednesday’s late-day selloff and continues consolidating recent gains above 2,900 support. The Fed released its latest policy statement Wednesday and told us it was raising interest rates a quarter percent. 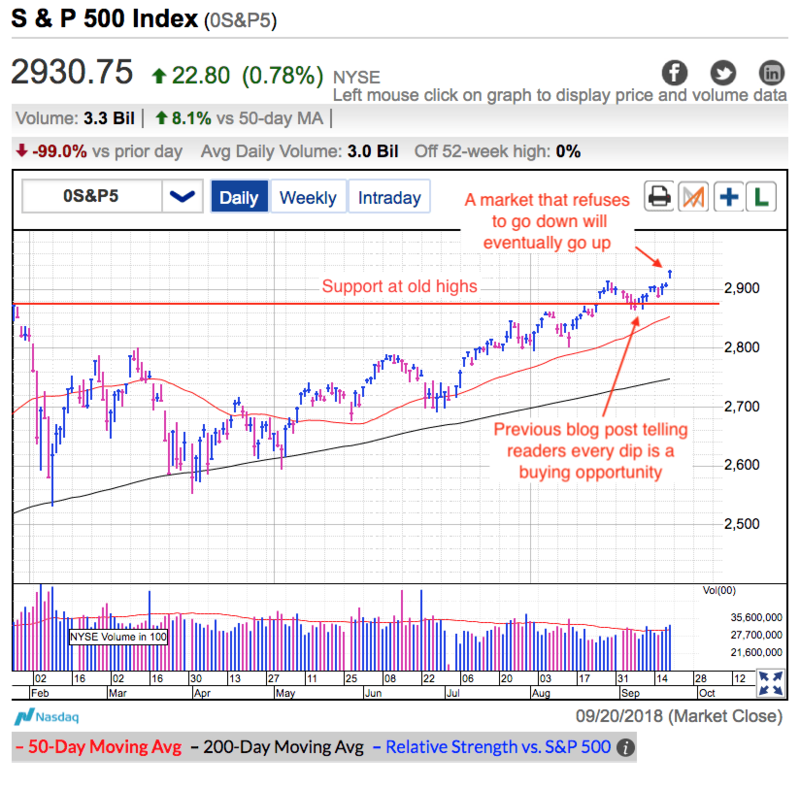 This move was widely expected, and the market initially rallied on the news. But later the Fed chairman told us rate hikes would continue through next year, eventually pushing us to 3%. The market got cold feet and tumbled into the red, and the selling got worse after Powell commented he thought stocks were overpriced. For anyone that lived through 2013’s “Taper Tantrum”, Wednesday’s 0.3% dip wasn’t even a bump in the road. Thursday’s resilient price-action further confirmed most owners are not worried about the Fed’s rate increases…as long as the economic forecasts remain strong. The Fed lifted interest rates eight times over the last few years and another three or four increases over the next couple of years won’t be any more shocking to the system. As shorter-term traders, the only thing that matters is the market’s reaction to these headlines. And so far stocks are shrugging them off. Maybe this will turn into a bigger deal down the road, but until then we don’t need to worry about it. This is a strong market, and it wants to keep going higher. Until that changes, we stick with what has been working. The consolidation above 2,900 remains intact. If we were overbought and vulnerable to a correction, this week’s trade war and interest rate headlines were more than bearish enough to send us tumbling. Maybe bears will be proven right eventually, but they are definitely wrong right now. Timing is everything in the stock market and early is the same thing as wrong. The biggest advantage of being small investors is we don’t need to look months and years into the future like big money managers do. Our smaller size means we can dart in and out of the market and only need to look days and weeks ahead. Things still look great for a year-end rally and that is how we should be positioned. No doubt we will run into challenges next year, but we will worry about those things when the time comes. For now, we stick with what has been working. There is not a lot to do with our short-term money. Either we stay and cash and wait for a more attractive opportunity, or we stretch our time-horizon and ride the eventual move higher. Of course, there is no free lunch and holding stocks is risky. Anyone waiting for the next move higher needs to be prepared to sit through near-term uncertainty and volatility. Highflying tech stocks lead Thursday’s charge higher, and worries about this sector are fading from memory. Even FB and NFLX are joining the party and climbed off their post-earnings lows. This hot sector will peak at some point, but this is not that point, and these stocks will lead the year-end rally. TSLA got hammered after the close when securities regulators sued Elon Musk for fraud and sought to remove him from Tesla. The stock tumbled 13% in after-hours trade as the “Musk Premium” evaporated. While this will be a much bigger story and no doubt the selloff could get larger, I actually think the market is getting this one wrong. TSLA is currently navigating the rocky transition from disruptor to operator. No doubt Musk is a great visionary, but his execution skills leave a lot to be desired. The company no longer needs bold ideas; it needs to deliver on the promises it already made. The company needs leadership to take it from small, niche producer to a global competitor. Many people thought Jobs’ departure from AAPL would end of the company’s ride at the top, but AAPL didn’t need more innovation, it needed execution. And since Tim Cook took the reigns, the stock is up 450%. Something very similar could happen at TSLA……assuming they don’t go bankrupt between here and there. But if the company recruits a world-class operator as its next CEO, this whole episode could actually be a good thing for the company and its stock. The S&P 500 traded sideways for a second day as it consolidates last week’s breakout to all-time highs. Trump and his trade war continue dominating economic headlines, but so far our stock market doesn’t mind. As usual, confident owners refuse to sell and that is keeping a floor under prices. But stubbornly tight supply is only half of the story. To keep going higher, we need demand and right now that is in short supply. This market most definitely doesn’t want to go down. All summer it refused countless opportunities to tumble on bearish headlines. As I’ve been saying for a while, a market that refuses to go down will eventually go up. And that is precisely what happened here. But at the same time, there is enough headline uncertainty to keep those with cash from chasing prices higher. Their lack of buying is keeping a lid on this market. No doubt we will keep going higher over the medium- and longer-term, but it will take time for those with cash to warm up to these record high prices. There is nothing to do with our favorite long-term positions except keep holding them and letting the profits come to us. This is a slow-money market and it rewards patience. As for our short-term money, there isn’t a lot to do here. Either we sit in cash and wait for the next trading opportunity (we cannot buy the next dip if we don’t have cash! ), or we stretch our time horizon a little and enjoy this ride higher. But if you are buying, be prepared to ride through a few dips along the way. Remember, this is a strong market and we buy the dips, we don’t sell them. This market is still setting up nicely for a year-end rally and we should keep doing what has been working. Don’t let the bears convince you otherwise. AMZN and AAPL continue consolidating following last month’s impressive, but ultimately unsustainable climb higher. Pullbacks and consolidations are a very normal and healthy part of every move higher. These stocks are acting well and I would be far more worried about them if they didn’t pause to catch their breath. FB and NFLX are basing following last month’s disappointing earnings. But this is a good thing. Traders that missed these highfliers had been praying for a pullback so they could jump aboard. Unfortunately, many of these same people are now too afraid to take advantage of these discounts. The thing to remember is risk is a function of height. These are some of the least risky places to be buying these stocks in six months. Without a doubt, this is a better time to be buying than a few months ago when the crowd thought everything was great. Bitcoin continues holding $6k support, but I wish I could say that was a good thing. While we held $6k support firmly for nearly six months, every bounce has been getting lower. First, we bounced to $17k. Then it was $12k. $10k came next. After that $8.5k. Earlier this month it was $7.5k and this weekend we stalled $6.8k. At this point, it is only a matter of time before we tumble under $6k support. As long as owners are more inclined to sell the bounces than buying them, prices will keep getting lower. It is only a matter of time before owners are kicking themselves for not selling when prices were above $6k. A market that refuses to go down….. The S&P 500 surged to fresh highs as investors chose to ignore trade war headlines and instead embraced optimistic third-quarter forecasts. While it is easy to say the market doesn’t care about Trump’s trade war after we surged to record highs. It wasn’t nearly as obvious three weeks ago when a lot of owners were selling the fear and uncertainty, causing prices to fall four days in a row, and five out of six trading sessions. We get paid for seeing these things before everyone else, not after it is obvious to the crowd. Nothing has been resolved between the US, China, Europe, and Canada and no doubt things will get worse before they get better. But our market has been telling us all summer it doesn’t care. These events haven’t put a noticeable dent in our economy or corporate profits, so most investors are ignoring the noise. So far Trump’s trade war went from $15 billion in steel and aluminum tariffs to now we are taxing more than 50% of everything that comes from China, and they are taxing 85% of everything we send their way. The way both sides are going, a further escalation is inevitable, That means we are not far away from both sides taxing everything. But if the market doesn’t care about 50%, bumping it up to 100% won’t make much of a difference. Without a doubt, we are living in a “half-full” environment where most traders assume things will turn out for the best. That’s why owners overlook negative trade headlines so quickly. This is a typical trait of an aging bull market. Five years ago traders were afraid of their own shadow and panic-sold every bump in the road. The catastrophic injuries suffered during the 2008 financial crisis were fresh in most investors’ minds, and they lived in fear of a repeat. But here we are nearly ten years later and every defensive sale proved to be a costly mistake. After years of getting burned selling prematurely, most traders learned to stop reacting defensively. That’s how we ended up in this situation where the market refuses to sell off no matter what the headlines are. While conventional wisdom tells us complacency precedes the fall, what conventional wisdom fails to mention is periods of complacency last far longer than anyone thinks possible. No doubt this bull market will die like all the others that preceded it, but it will not be dying anytime soon and we should enjoy the ride higher. There is nothing to do with our longer-term investments expect to hang on and enjoy the ride. Things are a little more challenging with our short-term money. We are left with a choice of either staying in cash and waiting for the next buyable dip. (Cannot buy the dip if we don’t have cash!) Or shifting our time horizon and sticking with a medium-term buy-and-hold. Neither choice is wrong; it largely depends on a person’s trading philosophy and risk tolerance. The next significant milestone is 3,000 and at this rate, it is only a few weeks away. Bad news won’t take us down and good news will push us higher. These record highs are scary, but a market that refuses to go down will eventually go up.